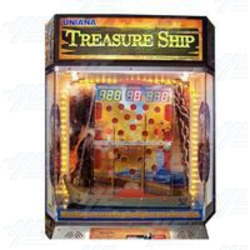 The Treasure Ship redemption game manufactured by Uniana is now available in Australia through Highway Entertainment. Treasure Ship players must manoeuvre the silver ball in the machine into the various scoring holes by turning the ships 'steering wheel'. Points range from 10 to 70, with tickets dispensed according to scores. The ticket redemption version of the machine is currently on offer, however, a capsule prize out version of the machine is also available on request.